Remember Jay the Mini Chow? We still have not been able to re-home him! I need all your help in finding him a new home soon! Apparently the owner's dad has put a strict timetable on his survival. 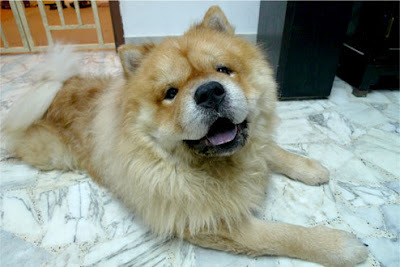 As you can see, he is 5 years old, not a very big Chow at all! that why we call him a Mini Chow! He is rather well-behaved and makes a great companion! But it looks like he is in need of a grooming soon! Just in case you guys have forgotten the contact details, it is Mandy, 96567222. Or you can also contact Pa at killertouch@hotmail.com no problem. His head is not in proportion with his body. We hope he finds a good home soon. Yeah, he needs to be groomed badly. i have sent an email to the address stated below. would really love to meet jay jay 'in dog'! my fiance and i are sincere in having a new member join our family. hope to hear a reply. Adoption Viewing for Tripod on Good Friday! 1st Runner up to Club Pets Magazine! 3 month old Tripod is needs a home!